A few weeks ago “Mr. Dollar” sent me an email. He wrote a wonderful guest post a few years ago, and he wanted to know why it disappeared. I poked that button, by mistake, several months ago, so his post (and twelve other guest posts) were gone from the website — and I didn’t know it happened until Mr. Dollar wrote that email. It took a few days, but now all of the posts that were accidentally hidden are back online, with their photos. 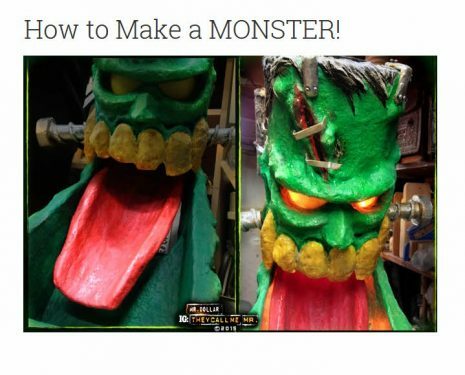 To see those posts and over 488 paper mache recipes and projects on this site, visit the Blog or Art Library, or use the search bar at the top of the site. So the temporary ‘crisis’ is over, but it reminded me that we used to get a lot of guest posts. We still do get some amazing guest posts every month or two, but not nearly as many as we used to. When Mr. Dollar submitted his post, it was because he saw a notice on the sidebar of the site asking for guest posts. For no obvious reason I removed that notice. I put the notice back on the sidebar this morning. 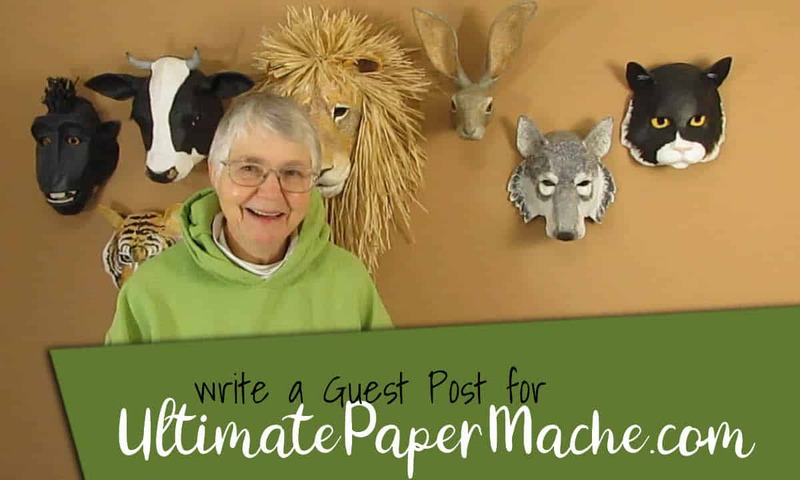 I do accept guest posts, as long as they’re about a paper mache project you designed yourself, or about some aspect of the paper mache sculpting process. It would even be fun to hear from someone who is making a living selling their sculptures or masks – we get a lot of questions about that, so an expert’s advice would be welcome. Guest posts must be tutorial or how-to articles, not just pictures of sculptures or masks that you’ve made. If you have an online store or website where you sell your work, please be sure to let me know so I can put a link to your site at the top of your post. Creating a post is fun, and guest posts almost always get a lot of comments and positive feedback from our readers. If you’d like to teach us how you made your latest paper mache sculpture or mask, just let me know what you have in mind by sending me an email. Details can be found on the contact page. 🙂 this is my 1st Paper Mache glad it turned out. But i still have to finish off little bits. Hi there. I’ve tried this for my 1st Mache & really enjoyed it. But can you tell me plz how do you do the over laps of the skins or the skin effect as this is quite difficult for me. Hi Paul. I think your photo was too large for the comment section. If you make it a bit smaller, I hope you’ll try again. Overlaps can be challenging. How are you doing it now? Be sure you tear the paper instead of cutting them, and then press down the overlapping paper really tight against the armature. Jonnie, really love your work. what would you recommend to use in building a bulldog face and semi body on canvas? I’m wanting to create this for my daughter. She loves bulldogs. Is it better to create the whole body separately in paper mache or a protruding face and background body on canvas. Would love some advice. Hi Marguerite. I have never used paper mache along with canvas, so I’m the wrong person to ask. Maybe one of our other readers will have some ideas for you. The one thing I would worry about is attaching your sculpture to a flexible material like canvas. If I created a 3-dimentional painting, I’d probably put it on something solid, like Masonite. But it’s probably possible to do it with canvas – I just don’t know how. Does anyone else have some ideas for Marguerite? Marguerite, I have done paper mache on canvas but I used a canvas board rather than a regular canvas. Even so, it warped while drying and it was difficult to get it in a frame. It might be better to make the sculpture part and then glue it to the canvas with epoxy, or do a masonite or wood board. Good luck and make sure you post your final project on the daily sculptors page! Jonni, it is interesting to hear about other folk’s works and their process. I look forward to seeing what projects others will post. I would enjoy sharing my process as well, which is a very different application. When my health improves I’ll attempt to do so. You’ve been so generous and kind. Sharing your methods and experience with everyone over the years. If a tutorial from one of us would help support your site I think all of us ought to consider it. ? Thxs for everything you do! I hope you’re feeling better soon! And not just because your “very different application” has me very curious, and I know we’d love to see it. Get well! Jonni, Thanks for the well wishes. Will do my best. I’ll start thinking of my process and how to present in a tutorial. You provide a great model for us. Yours are great. ? Jonni- one of the reasons (in my opinion)that you are not getting as many guest posts is because you have so many wonderful tutorials. Between your tutorials and your guest posts, there isn’t a whole lot that hasn’t been covered! Learning by doing a project is the best and I love hearing people’s rationales as to why they chose a certain technique,etc. Now that you did this little post, I am sure people will step up and show us their process. I have an idea for one but it will have to wait for next year so I can get appropriate pictures and the like. I will tell your readers that Jonni makes writing a tutorial very easy. It just takes a little planning on your part to remember to take pictures and sync up those pics to your content. It is fun. Good luck Jonni- I hope you are not inundated with too many new guest posts! I can’t wait to see your next post! I’ve been working on a variety of sculptures. From human heads to moons to the sun. Love this!